Probably, never will I understand why and how people react to things. In the middle of watching "A Death In The Gunj"
A- This is Om Puri's last film. He looks great. Man Friday (MF)- WHAT? OM PURI IS DEAD? A- Dude he died long back. Like November 2016 type. What's wrong with you? MF- I HAD NO IDEA. WHEN DID HE DIE? On the middle of the road. A- "This Hao Shi Nian Nian was owned by Jagjit Singh. I don't know what happened after he died." ChatBot- "WHAT? Jagjit Singh is dead? I actually liked him." A- "Dude he died like long back. Some couple of years ago. Why do you not know this?" CB- "WHAT? MY LIFE IS A LIE. NO ONE TOLD ME THIS." A- "HAHA I will never understand why people don't know Kader Khan is alive." BCB- "WHAT? 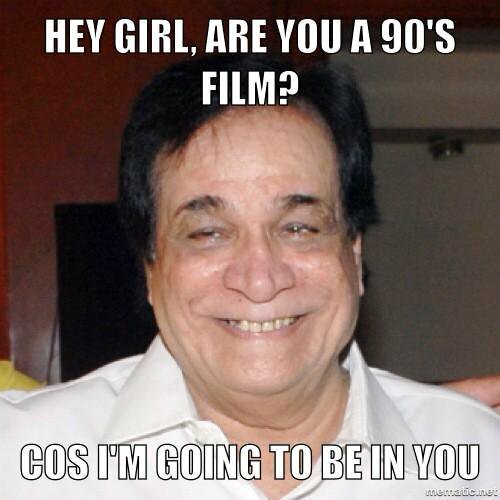 KADER KHAN IS ALIVE?" A- "I literally just tried making that point and now you?" BCB- "Oh yeah, I had no idea. I thought he was dead." A- "Kader Khan is alive. I won a bet last year against my mum. She also thought he's dead. He's very much alive."